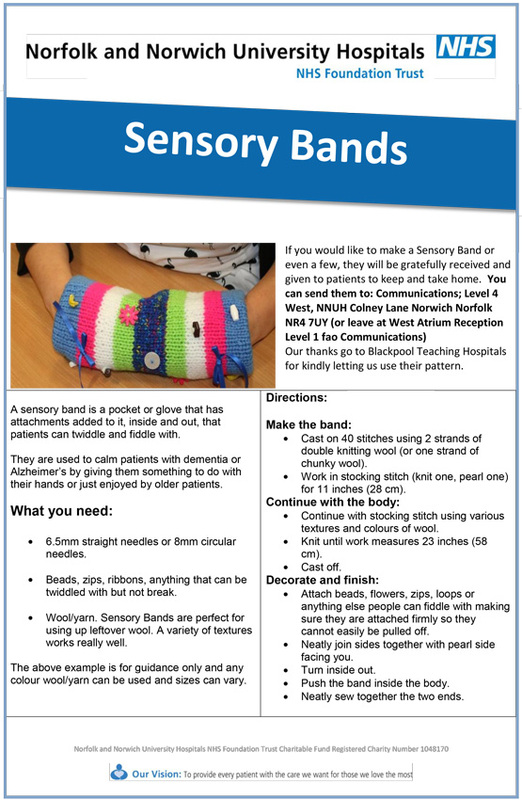 I have just added sensory bands to my list of things to make. Apparently they help people with severe dementia find a bit of comfort and distraction. Dementia is probably my biggest fear. I dread the possibility of growing old and confused. Not knowing what’s going on or what I’m doing, being constantly lost and unable to communicate. I can’t imagine anything I’d hate more. Anything that helps people in that condition find a few moments of peace has to be a good thing. Normally I’d wait to post until I’ve at least started a project, but this is a new appeal and they need more people to join in, so please, if you knit think about giving this a try. Actually, I’m sure crochet versions would be just as good so if you crochet maybe you could consider it too. It’s super easy – just a tube with random bits of stuff attached. And since I’ve been asked for instructions here’s how I did it. You need a ball of red, orange and yellow wool. I just used cheap basic DK because I am a cheapskate and was just playing around but posh stuff would probably make it nicer. I used 6.5mm needles. If you’re so inclined you could use dpns and knit in the round, but I just went with what I had handy. Start with the basic hat. Using the orange wool. Cast on 70 stitches using whatever cast on method you like. Switch to stocking stitch and keep going until you have about 4.5 inches of knitting. Cut your wool leaving a fairly long tail, thread through the remaining loops and pull tight – use the tail to sew together the seam as far as the orange, use orange to sew the bottom part. Now you need to add the ear flaps – The flaps want to be about half the width of the hat (a quarter each) Find a point half way down each side and using the red wool pick up stitches evenly either side of that. You want to pick up 17 stitches so 8 either side of your central point. Make a pom-pom from all 3 colours and attach to the top of the hat. I find wrapping the wool around the prongs of a large fork easiest but it doesn’t really matter how you do it. Weave in all the ends. And that’s it. 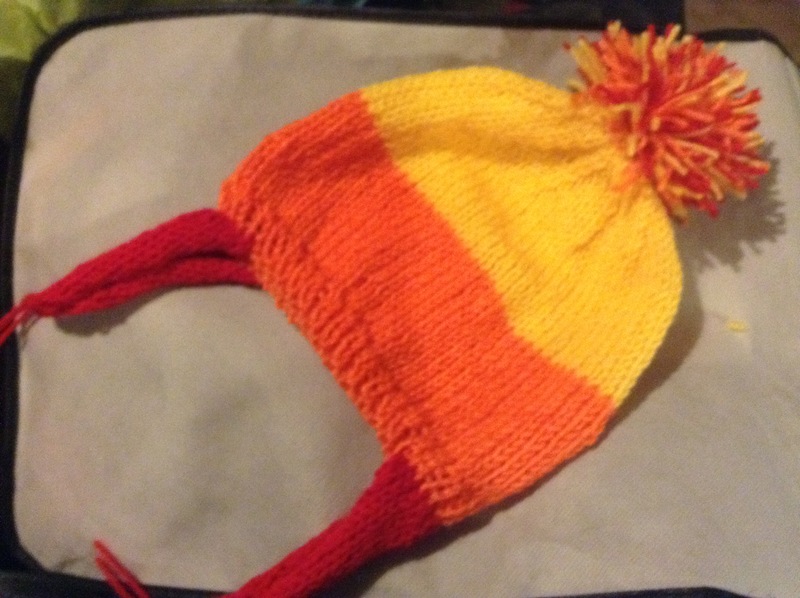 Your cunning hat is now ready to wear. 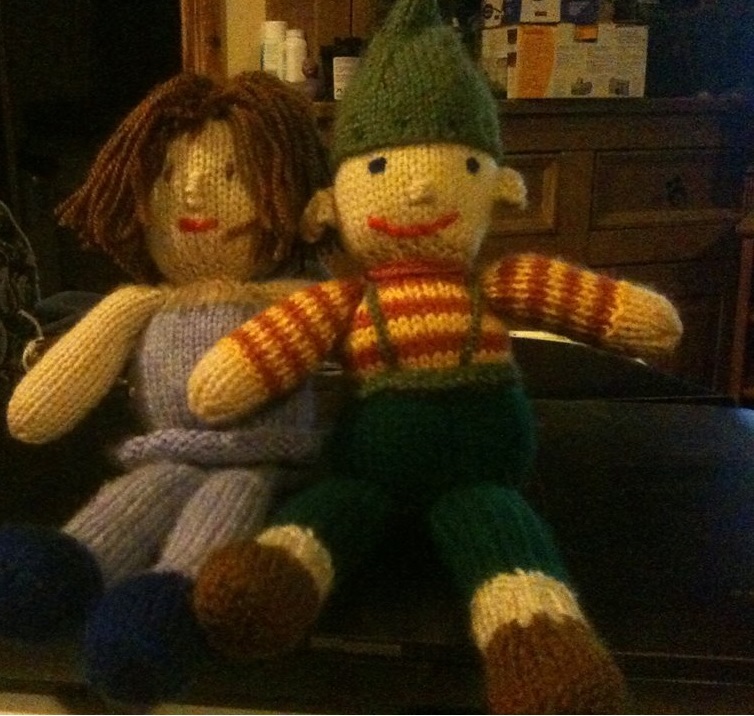 I’ve been doing a bit of knitting. They’re based on the Rufus the Leprechaun pattern which I found online. I changed the colours, lost the beard and added a skirt, wings and hair for the fairy and big ears and a pointy hat for the elf. I had a terrible time with the scalloped edging to the fairy skirt, but I got there in the end by mingling together various different patterns I’d seen online. It sort of works if you don’t look too closely. Anyway, they are off to their new owners tonight (a young brother and sister I know through my part time job) so hopefully they will get lots of loving and no picking over the details.